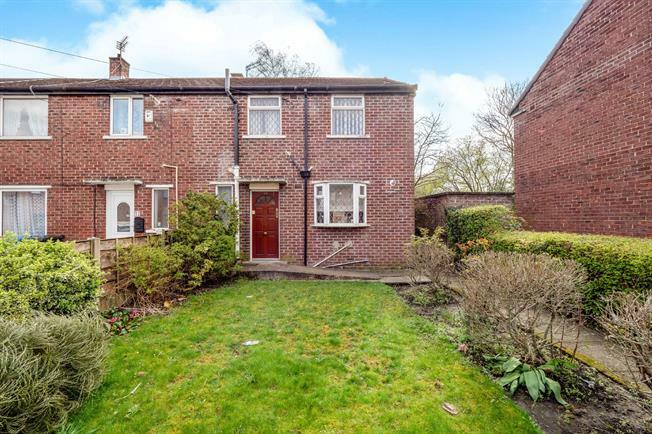 3 Bedroom End of Terrace House For Sale in Salford for Offers Over £140,000. This well maintained three bedroom property is ideal for first time buyers or buy to let investors. Offering excellent living space throughout and in a fantastic location for access to the city centre. Featuring an entrance hall, great size lounge and a spacious kitchen. To the first floor are three fantastic size bedrooms and a fitted bathroom suite. Externally, there is a good size front garden and a great size rear garden which is not overlooked. The property is in need of cosmetic modernisation, however benefits from a modern gas central heating system. Viewings are highly recommended! Hardwood front single glazed door. Single glazed uPVC window facing the front. Double aspect single glazed uPVC windows facing the rear overlooking the garden. Radiator and gas fire, carpeted flooring, fitted shelves. Double glazed uPVC box bay window facing the front. Vinyl flooring, boiler, tiled walls. Roll top work surface, wall and base units, single sink with mixer tap and drainer, freestanding oven, space for washing machine and fridge/freezer. Double bedroom; single glazed uPVC window facing the rear overlooking the garden. Radiator, carpeted flooring. Single glazed uPVC window facing the front. Radiator, carpeted flooring. Single glazed uPVC window with obscure glass facing the front. Radiator, carpeted flooring, built-in storage cupboard, tiled walls. Low level WC, panelled bath, pedestal sink.